The notion of Los Angeles as a wonderful place of opportunity contributed to the western migration of thousands of Americans, including African Americans escaping racism and violence in the South. But Los Angeles blacks encountered a white backlash, and the doors of opportunity were closed in the form of housing covenants, job discrimination, and school segregation. African Americans fought for equality, building strength in community and collective identity that became their ongoing Los Angeles legacy. 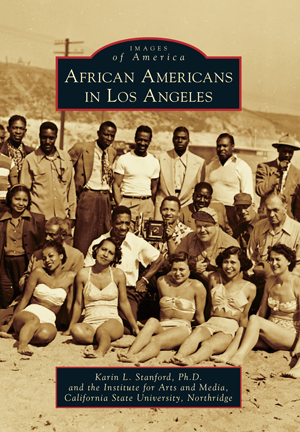 This story, encapsulated here in vintage photographs, encompasses the settlers of African descent, antislavery and antidiscrimination efforts, and their cultural contributions on Central Avenue and in Hollywood. Also shown are important flash points, including the 1965 Watts uprising and the O. J. Simpson murder trial. The story of African Americans in Los Angeles is one of promise, dreams, and opportunity realized through survival, willfulness, and foresight. A native of Los Angeles whose family migrated to California from the South in 1944, author Karin L. Stanford, Ph.D., is an associate professor of political science in the Pan African Studies department at California State University, Northridge. She culled this collection of historical images from public and private sources, including those from the Institute for Arts and Media, California State University, Northridge.